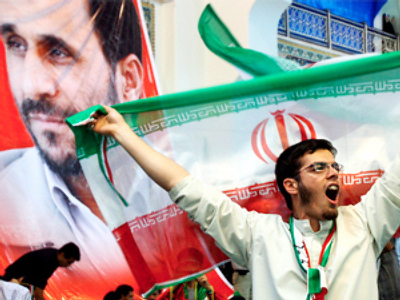 Incumbent Mahmoud Ahmadinejad has won a landslide victory in the Iranian presidential elections with most of the votes counted, the country's electoral commission has announced. According to a report of the task group holding the elections, by early Saturday morning 77.13% of ballot boxes were opened. 65.24% of the votes were cast for Ahmadinejad. His main rival Mir Hossein Moussavi got 31.83% of processed ballot papers. However, the opposition has said it will contest the outcome and has complained of voting irregularities such as ballot rigging. The announcement of the official results has been put on hold for fear of potential violence in the streets. Earlier in the week, the president's military force warned it would crush any attempted overthrow of the Islamic regime by Moussavi’s movement. Moussavi in turn accused the Islamic establishment of manipulating the people's vote to keep Ahmadinejad in power. During the voting, some communications across Iran were disrupted. Ahmadinejad supporters reportedly pelted one of Moussavi’s offices with tear gas canisters. Moussavi raised hopes at home and abroad that, if elected, he would welcome US President Barack Obama's invitation to open dialogue.